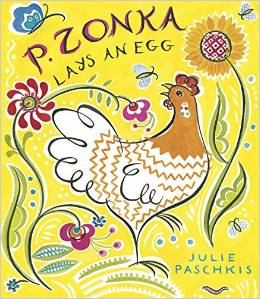 P. Zonka would rather spend her day “staring at flowers and gawking at clouds” instead of laying eggs. This irritates the other chickens to no end. Why won’t she lay an egg? What’s the matter with her? P. Zonka wonders the opposite. How can they think about laying eggs when there is such beauty all around? …the soft dark moss, the stripes on the crocuses, the orange cat with one blue eye, the shining center of a dandelion, the sky at midnight. The hens (Nadine, Dora, and Maud, plus Gloria, a misnamed rooster) continue to goad P. Zonka. They call her lazy and urge her to try. Finally, she gives in and attempts to lay an egg. It isn’t easy, but when she finally does, she produces a spectacular egg as original and unique and colorful as P. Zonka, herself. Daydreamers rejoice! Good things come to those who wait – a great message for young readers. Second graders will also benefit from the themes of individuality and artistry. Paschkis’ watercolor drawings are a feast for the eyes, and her endnote reveals the secret behind P. Zonka’s unusual name: a pysanka is a Ukrainian decorated egg made with patterns of beeswax and layers of dye. Recommended as a classroom read-aloud or library selection.